At last the mass media have turned their attention to the reality of excessively high drug prices in the U.S. It wasn't that reporters and editors, during the past several decades, failed to notice how drug prices here are double and triple those of other advanced countries. In fact, for twenty years or more, they published news stories about seniors taking bus rides to Canada to buy their medications, even as some people regularly faced the dilemma about whether to buy food or drugs. But since drug ads provide a major revenue source for media outlets, mass journalism largely failed to treat the matter as a major, persistent social problem. Instead, the stories about trips to Canada and rent-versus-drugs usually lacked useful context, instead appearing as quaint pieces of human interest or as quizzical parts of the passing fanfare. Recently the media have been running stories where health care analysts, physicians, administrators at provider networks and other observers eagerly discuss their respective ideas for curtailing drug prices. Four recent approaches to the matter deserve some attention. The first was prompted by last week's announcement from Britain's National Health Service that the number of therapies its Cancer Drug Fund covers would be cut by 30% to contain unsustainable costs. 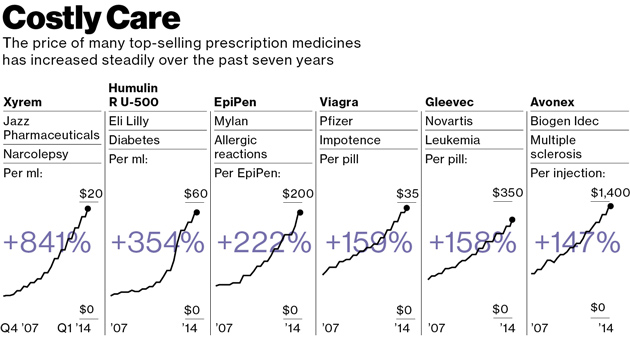 Cancer drugs stand in the front line of soaring drug prices. As the United Nations predicts the number of people worldwide over age 65 will triple between 2010 and 2050, the older population will spike the incidence of age-related diseases such as cancer. The WHO predicts a 70% increase in the number of cancer cases during the next 20 years. Global spending on cancer drugs already has more than doubled in the past decade, according to IMS, a pharma data collector. This led pharma consultant Bernard Munos to tell the Financial Times that "the cost of these drugs is not sustainable...[and] what is happening in the UK today will happen in America tomorrow.” Mr. Munos claims the best answer lies in ending Big Pharma R&D and outsourcing the function to smaller, nimbler biotechs and startups with lower expense levels. That sounds reasonable but it is unlikely to contain spiraling drug costs. Big Pharmas are already moving in that direction by buying biotechs or making deals to subsidize research at the smaller companies. The entire thrust of research across the range of specialty products in areas such as oncology, auto-immune diseases, and virology already involves research by university medical centers and small biotechs. Munos's suggestion fails entirely to get at the heart of the matter. As leukemia specialist Hagop Kantarjian, at Houston's MD Anderson Cancer Center, told the Financial Times, "no amount of innovation can justify the doubling in average US prices over the past decade to more than $100,000. 'It is profiteering and greed,' he says." A second line of analysis proceeds by ignoring growing drug costs and, instead, recommends giving everyone a vastly more generous prescription drug plan. This month, in the American Journal of Public Health, researchers at Brigham and Women's Hospital in Boston published their analysis of more than a score of studies that appeared between 1990 and 2013. They found that better insurance for prescription drugs could help reduce total health care costs by lowering the levels of sickness and death. The authors point out that although more generous benefits would create some higher initial costs, they claim the reductions in "preventable patient morbidity and mortality" would more than offset those costs. Although less sickness and death do represent the goals of health care, the fact is that obtaining such desirable outcomes without controlling drug costs would provide pharma with a blank check to gouge every public and private payer. 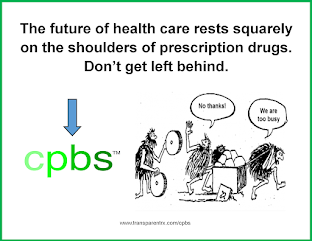 Funding for the generous prescription plans recommended by the authors would have to come from somewhere and, ultimately, that means the American consumer and taxpayer would foot the bill to enrich pharma. By failing to give drug cost control equal consideration with coverage enhancement, the authors relegate their study to the category of blue sky irrelevance. As long as drug companies can pay their pharmaco-economic analysts to make the case that a drug's total of direct, indirect and implied costs reduce higher spending somewhere down the line, pharma will abuse the results. They will try pushing expensive products intended for a select number of patients on the vast majority. The emerging class for LDL cholesterol, PCSK-9's, represent a clear example of that. Once pharma launches its PCSK-9 inhhibitors, the industry's flacks among medical opinion leaders will scare up business for their sponsors and grants for themselves under the-lower-the-better banner by recommending the new class for everyone, not just the familial homozygous. Pretty soon, a $1,000 a pill will seem cheap. But other analysts offer a bit more hope for controlling drug prices. In last week's New York Times, Dr. Peter Bach, a physician and the director of Memorial Sloan Kettering's Center for Health Policy and Outcomes in New York, moved a step beyond a blank check for the drug companies. Dr. Bach essentially recommended that public payers such as Medicare and Medicaid manage their drug formularies similarly to the way Express Scrips, the largest pharmacy benefit manager for private payers, has started to do. According to Dr. Bach, the law requiring public payers to cover all approved drug products permits pharma to maintain its pricing cartel, rather than obliging brands in the same category to compete on price. By competing for reimbursable status on restrictive drug formularies that cover a limited number of medications, drug companies would have to offer optimal cost-effectiveness. A third, fourth or fifth competitor in a class wouldn't get covered by a prescription plan if it offers comparable effectiveness at a similar cost to what's already available. Lacking a substantially better clinical profile, a company would have to compete on price to get its product covered. According to Dr. Bach, the mere threat by European countries to deny reimbursement contributes significantly to the fact that their drug prices are half as much as what the U.S. pays. If the action holds and isn't reversed by the country's business-fawning prime minister, it will mean generics companies there such as Natco will be able to sell the medication for $1 a pill instead of the $1,000 that Gilead extorts from U.S. payers. Leena Menghaney from Doctors Without Borders praised the effort to deny Sovaldi a patent, claiming it would allow open market competition in India. Now here Dr. Bach's observation holds true in that just the threat of compulsory licensing, exercised only rarely, can be enough to curb pharma's unmitigated greed. That enables a range of remedies for controlling drug prices, from mild and regular to harsh and infrequent. Alas, the successful containment of drug costs, whether through these or other means, demands an aggressive vigilance and some public empathy on the part of politicians and payers. Unfortunately, it remains unlikely that the majority in Congress, in thrall to the moneyed interests of pharma and major hospital networks, possess any public empathy outside their duck dynasty and C-suite constituencies. Health insurers, for their part, remain too contented paying enormous compensations to their senior executives while costs for the middle class continue to grow. Meantime, as health care costs expand the sector from its current 18% of GDP to 20% and beyond, no safeguard exists for preventing pharma from jeopardizing the very qualities their products are supposed to improve -- the length and quality of life.